ISLAMABAD, Pakistan (CNN) -- Pakistani security forces will observe a four-day cease-fire with Taliban militants in another region of North West Frontier Province, Pakistan's state-run news agency reported Tuesday. 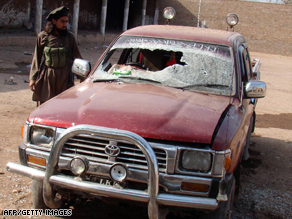 A man stands beside a damaged vehicle after a Pakistani attack on Taliban militants on the Afghan border. Tribal leaders in the Bajaur region had asked the government forces to observe a truce that had been unilaterally called for by local Taliban militants, according to the state-run Associated Press of Pakistan (APP). The four-day cease-fire is scheduled to begin on Wednesday, according to Shafirullah Khan, a local leader in Bajaur, who spoke to APP. Pakistani security forces will cease all military operations, but would respond if attacked, Khan said in the report. Earlier in the day, Taliban militants announced they would indefinitely extend a 10-day cease-fire in the Swat region of North West Frontier Province which they declared eight days ago. Pakistan's government is trying to hold off Taliban militants who have terrorized the region with beheadings, kidnappings, and the destruction of hundreds of schools. Critics have called the cease-fire deals with the Taliban and their allies a major concession that could worsen the situation in Pakistan. But analysts and political observers say the government has little choice but to capitulate.